Katherine McLeod has over 20 years experience bringing children's story and theatre productions to fruition. She has now launched Camp Magic Productions' first interactive storytelling theatre show at the Esplanade's Octoburst Festival in Singapore. After five successful sell-out performances, this new company is gearing up for another run in Singapore from September 23 - October 5, 2013. Please contact us for school group and family bookings. My Forest Room is a story within a story within a story. It gives both children and adults the opportunity to enjoy and understand our steady shifting internal ecologies. Through this layered performance, a deepened connection to our earth's ecology is realized. Ultimately, these discoveries lead us to a more profound sense of compassion for all life. The core story was created by Katherine McLeod and the children at Camp Magic during the 2010 Solstice program. It is about a baby orangutan and his mother in the Borneo rainforest. The story looks deeply into the feelings of the animals as they experience the destruction of their forest home. Children and adults learn more about why the rainforest is being destroyed. Through this community recognition, audience is given a chance to empathize and connect with different life forms that are foreign to us in our urban environments. A beautiful story that weaves songs, movement, puppets, drums, audience participation, and superb guitar music. This show is performed in the round, with an amazing fabric, hand-felted, and paper mache rainforest surrounding the audience. A rare opportunity for schools and families to explore the rainforest in the heart of Singapore. 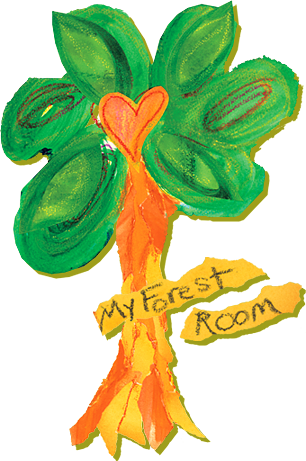 Please contact us for performance availability should you wish to include My Forest Room in an upcoming festival or school show.